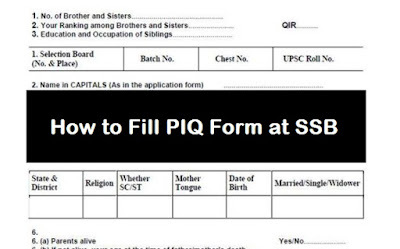 Fill PIQ Form for SSB - Download PIQ- Hello Aspirants, looking to download PIQ form. Going for SSB and want to know hot to fill PIQ form and download PIQ. To face different tests in the form of Pysch, GTO and Interview at the SSB. When candidates go for screening they are given to fill the PIQ (Personal Information Questionarie Form) which includes the details about their personal life, families, education etc. In the complete SSB procedure you will be filling PIQ form 2-3 times. Candidates have to be very carefully by filling the PIQ form because this questions will be asked you in the Personal Interview (PI) and the IO(Interviewing Officer) will cross question on the details you have filled. This PIQ will decide your entry in Indian armed forces. Aspirants have to filled it very CAREFULLY and NEATLY without any cuts and mistakes in proper margins and order.Any wrong information or data about you can harm your entry in Indian armed forces.Checkout the article below and read important points about PIQ. Feel free to ask below in comments. 10. Age (year + Months) ……………………….Height (in metre)……………………..
11. Present Occupation and personal monthly income, if any…………………. 13. a) Participation in Games & Sports………………………………………………………. c) Participation in extra-Curricular Activities………………………………………….. This was all about How to Fill PIQ Form at SSB. Candidates are requested to fill this form accurately and clearly all your Personal details should be true because your Personal interview will be based on this all the questions will be asked from this. To know more about SSB tips follow us on Facebook or visit our website regularly. 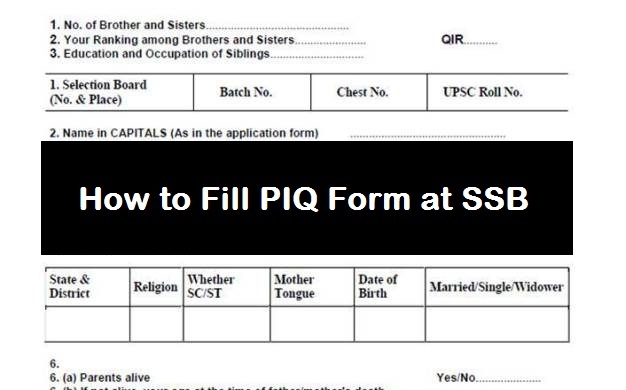 Feel free to comment below if you have any questions in mind regarding fill PIQ and download PIQ form for SSB kindly comment below.